The two parties which divide the state, the party of Conservatism and that of Innovation, are very old, and have disputed the possession of the world ever since it was made. This quarrel is the subject of civil history. The conservative party established the reverend hierarchies and monarchies of the most ancient world. The battle of patrician and plebeian, of parent state and colony, of old usage and accommodation to new facts, of the rich and the poor, reappears in all countries and times. The war rages not only in battle-fields, in national councils, and ecclesiastical synods, but agitates every man's bosom with opposing advantages every hour. On rolls the old world meantime, and now one, now the other gets the day, and still the fight renews itself as if for the first time, under new names and hot personalities. The two parties which divide the state, the party of Conservatism and that of Innovation, are very old, and have disputed the possession of the world ever since it was made. This quarrel is the subject of civil history. The conservative party established the reverend hierarchies and monarchies of the most ancient world. The battle of patrician and plebeian, of parent state and colony, of old usage and accommodation to new facts, of the rich and the poor, reappears in all countries and times. The war rages not only in battle-fields, in national councils, and ecclesiastical synods, but agitates every man's bosom with opposing advantages every hour. On rolls the old world meantime, and now one, now the other gets the day, and still the fight renews itself as if for the first time, under new names and hot personalities. Such an irreconcilable antagonism, of course, must have a correspondent depth of seat in the human constitution. It is the opposition of Past and Future, of Memory and Hope, of the Understanding and the Reason. It is the primal antagonism, the appearance in trifles of the two poles of nature. 'I see,' rejoins Saturn, 'thou art in league with Night, thou art become an evil eye; thou spakest from love; now thy words smite me with hatred. I appeal to Fate, must there not be rest?' — 'I appeal to Fate also,' said Uranus, 'must there not be motion?' — But Saturn was silent, and went on making oysters for a thousand years. There is always a certain meanness in the argument of conservatism, joined with a certain superiority in its fact. It affirms because it holds. Its fingers clutch the fact, and it will not open its eyes to see a better fact. The castle, which conservatism is set to defend, is the actual state of things, good and bad. The project of innovation is the best possible state of things. Of course, conservatism always has the worst of the argument, is always apologizing, pleading a necessity, pleading that to change would be to deteriorate; it must saddle itself with the mountainous load of the violence and vice of society, must deny the possibility of good, deny ideas, and suspect and stone the prophet; whilst innovation is always in the right, triumphant, attacking, and sure of final success. Conservatism stands on man's confessed limitations; reform on his indisputable infinitude; conservatism on circumstance; liberalism on power; one goes to make an adroit member of the social frame; the other to postpone all things to the man himself; conservatism is debonnair and social; reform is individual and imperious. We are reformers in spring and summer; in autumn and winter, we stand by the old; reformers in the morning, conservers at night. Reform is affirmative, conservatism negative; conservatism goes for comfort, reform for truth. Conservatism is more candid to behold another's worth; reform more disposed to maintain and increase its own. Conservatism makes no poetry, breathes no prayer, has no invention; it is all memory. Reform has no gratitude, no prudence, no husbandry. It makes a great difference to your figure and to your thought, whether your foot is advancing or receding. Conservatism never puts the foot forward; in the hour when it does that, it is not establishment, but reform. Conservatism tends to universal seeming and treachery, believes in a negative fate; believes that men's temper governs them; that for me, it avails not to trust in principles; they will fail me; I must bend a little; it distrusts nature; it thinks there is a general law without a particular application, — law for all that does not include any one. Reform in its antagonism inclines to asinine resistance, to kick with hoofs; it runs to egotism and bloated self-conceit; it runs to a bodiless pretension, to unnatural refining and elevation, which ends in hypocrisy and sensual reaction. And so whilst we do not go beyond general statements, it may be safely affirmed of these two metaphysical antagonists, that each is a good half, but an impossible whole. Each exposes the abuses of the other, but in a true society, in a true man, both must combine. Nature does not give the crown of its approbation, namely, beauty, to any action or emblem or actor, but to one which combines both these elements; not to the rock which resists the waves from age to age, nor to the wave which lashes incessantly the rock, but the superior beauty is with the oak which stands with its hundred arms against the storms of a century, and grows every year like a sapling; or the river which ever flowing, yet is found in the same bed from age to age; or, greatest of all, the man who has subsisted for years amid the changes of nature, yet has distanced himself, so that when you remember what he was, and see what he is, you say, what strides! what a disparity is here! Throughout nature the past combines in every creature with the present. Each of the convolutions of the sea-shell, each node and spine marks one year of the fish's life, what was the mouth of the shell for one season, with the addition of new matter by the growth of the animal, becoming an ornamental node. The leaves and a shell of soft wood are all that the vegetation of this summer has made, but the solid columnar stem, which lifts that bank of foliage into the air to draw the eye and to cool us with its shade, is the gift and legacy of dead and buried years. In nature, each of these elements being always present, each theory has a natural support. As we take our stand on Necessity, or on Ethics, shall we go for the conservative, or for the reformer. If we read the world historically, we shall say, Of all the ages, the present hour and circumstance is the cumulative result; this is the best throw of the dice of nature that has yet been, or that is yet possible. If we see it from the side of Will, or the Moral Sentiment, we shall accuse the Past and the Present, and require the impossible of the Future. But although this bifold fact lies thus united in real nature, and so united that no man can continue to exist in whom both these elements do not work, yet men are not philosophers, but are rather very foolish children, who, by reason of their partiality, see everything in the most absurd manner, and are the victims at all times of the nearest object. There is even no philosopher who is a philosopher at all times. Our experience, our perception is conditioned by the need to acquire in parts and in succession, that is, with every truth a certain falsehood. As this is the invariable method of our training, we must give it allowance, and suffer men to learn as they have done for six millenniums, a word at a time, to pair off into insane parties, and learn the amount of truth each knows, by the denial of an equal amount of truth. For the present, then, to come at what sum is attainable to us, we must even hear the parties plead as parties. That which is best about conservatism, that which, though it cannot be expressed in detail, inspires reverence in all, is the Inevitable. There is the question not only, what the conservative says for himself? but, why must he say it? What insurmountable fact binds him to that side? Here is the fact which men call Fate, and fate in dread degrees, fate behind fate, not to be disposed of by the consideration that the Conscience commands this or that, but necessitating the question, whether the faculties of man will play him true in resisting the facts of universal experience? For although the commands of the Conscience are _essentially_ absolute, they are _historically_ limitary. Wisdom does not seek a literal rectitude, but an useful, that is, a conditioned one, such a one as the faculties of man and the constitution of things will warrant. The reformer, the partisan loses himself in driving to the utmost some specialty of right conduct, until his own nature and all nature resist him; but Wisdom attempts nothing enormous and disproportioned to its powers, nothing which it cannot perform or nearly perform. We have all a certain intellection or presentiment of reform existing in the mind, which does not yet descend into the character, and those who throw themselves blindly on this lose themselves. Whatever they attempt in that direction, fails, and reacts suicidally on the actor himself. This is the penalty of having transcended nature. For the existing world is not a dream, and cannot with impunity be treated as a dream; neither is it a disease; but it is the ground on which you stand, it is the mother of whom you were born. Reform converses with possibilities, perchance with impossibilities; but here is sacred fact. This also was true, or it could not be: it had life in it, or it could not have existed; it has life in it, or it could not continue. Your schemes may be feasible, or may not be, but this has the endorsement of nature and a long friendship and cohabitation with the powers of nature. This will stand until a better cast of the dice is made. The contest between the Future and the Past is one between Divinity entering, and Divinity departing. You are welcome to try your experiments, and, if you can, to displace the actual order by that ideal republic you announce, for nothing but God will expel God. But plainly the burden of proof must lie with the projector. We hold to this, until you can demonstrate something better. The system of property and law goes back for its origin to barbarous and sacred times; it is the fruit of the same mysterious cause as the mineral or animal world. There is a natural sentiment and prepossession in favor of age, of ancestors, of barbarous and aboriginal usages, which is a homage to the element of necessity and divinity which is in them. The respect for the old names of places, of mountains, and streams, is universal. The Indian and barbarous name can never be supplanted without loss. The ancients tell us that the gods loved the Ethiopians for their stable customs; and the Egyptians and Chaldeans, whose origin could not be explored, passed among the junior tribes of Greece and Italy for sacred nations. Moreover, so deep is the foundation of the existing social system, that it leaves no one out of it. We may be partial, but Fate is not. All men have their root in it. You who quarrel with the arrangements of society, and are willing to embroil all, and risk the indisputable good that exists, for the chance of better, live, move, and have your being in this, and your deeds contradict your words every day. For as you cannot jump from the ground without using the resistance of the ground, nor put out the boat to sea, without shoving from the shore, nor attain liberty without rejecting obligation, so you are under the necessity of using the Actual order of things, in order to disuse it; to live by it, whilst you wish to take away its life. The past has baked your loaf, and in the strength of its bread you would break up the oven. But you are betrayed by your own nature. You also are conservatives. However men please to style themselves, I see no other than a conservative party. You are not only identical with us in your needs, but also in your methods and aims. You quarrel with my conservatism, but it is to build up one of your own; it will have a new beginning, but the same course and end, the same trials, the same passions; among the lovers of the new I observe that there is a jealousy of the newest, and that the seceder from the seceder is as damnable as the pope himself. On these and the like grounds of general statement, conservatism plants itself without danger of being displaced. Especially before this _personal_ appeal, the innovator must confess his weakness, must confess that no man is to be found good enough to be entitled to stand champion for the principle. But when this great tendency comes to practical encounters, and is challenged by young men, to whom it is no abstraction, but a fact of hunger, distress, and exclusion from opportunities, it must needs seem injurious. The youth, of course, is an innovator by the fact of his birth. There he stands, newly born on the planet, a universal beggar, with all the reason of things, one would say, on his side. In his first consideration how to feed, clothe, and warm himself, he is met by warnings on every hand, that this thing and that thing have owners, and he must go elsewhere. Then he says; If I am born into the earth, where is my part? have the goodness, gentlemen of this world, to show me my wood-lot, where I may fell my wood, my field where to plant my corn, my pleasant ground where to build my cabin. And what is that peril? Knives and muskets, if we meet you in the act; imprisonment, if we find you afterward. And by what authority, kind gentlemen? And your law, — is it just? As just for you as it was for us. We wrought for others under this law, and got our lands so. I repeat the question, Is your law just? Not quite just, but necessary. Moreover, it is juster now than it was when we were born; we have made it milder and more equal. I will none of your law, returns the youth; it encumbers me. I cannot understand, or so much as spare time to read that needless library of your laws. Nature has sufficiently provided me with rewards and sharp penalties, to bind me not to transgress. Like the Persian noble of old, I ask "that I may neither command nor obey." I do not wish to enter into your complex social system. I shall serve those whom I can, and they who can will serve me. I shall seek those whom I love, and shun those whom I love not, and what more can all your laws render me? Your opposition is feather-brained and overfine. Young man, I have no skill to talk with you, but look at me; I have risen early and sat late, and toiled honestly, and painfully for very many years. I never dreamed about methods; I laid my bones to, and drudged for the good I possess; it was not got by fraud, nor by luck, but by work, and you must show me a warrant like these stubborn facts in your own fidelity and labor, before I suffer you, on the faith of a few fine words, to ride into my estate, and claim to scatter it as your own. Now you touch the heart of the matter, replies the reformer. To that fidelity and labor, I pay homage. I am unworthy to arraign your manner of living, until I too have been tried. But I should be more unworthy, if I did not tell you why I cannot walk in your steps. I find this vast network, which you call property, extended over the whole planet. I cannot occupy the bleakest crag of the White Hills or the Alleghany Range, but some man or corporation steps up to me to show me that it is his. Now, though I am very peaceable, and on my private account could well enough die, since it appears there was some mistake in my creation, and that I have been _mis_sent to this earth, where all the seats were already taken, — yet I feel called upon in behalf of rational nature, which I represent, to declare to you my opinion, that, if the Earth is yours, so also is it mine. All your aggregate existences are less to me a fact than is my own; as I am born to the earth, so the Earth is given to me, what I want of it to till and to plant; nor could I, without pusillanimity, omit to claim so much. I must not only have a name to live, I must live. My genius leads me to build a different manner of life from any of yours. I cannot then spare you the whole world. I love you better. I must tell you the truth practically; and take that which you call yours. It is God's world and mine; yours as much as you want, mine as much as I want. Besides, I know your ways; I know the symptoms of the disease. To the end of your power, you will serve this lie which cheats you. Your want is a gulf which the possession of the broad earth would not fill. Yonder sun in heaven you would pluck down from shining on the universe, and make him a property and privacy, if you could; and the moon and the north star you would quickly have occasion for in your closet and bed-chamber. What you do not want for use, you crave for ornament, and what your convenience could spare, your pride cannot. On the other hand, precisely the defence which was set up for the British Constitution, namely, that with all its admitted defects, rotten boroughs and monopolies, it worked well, and substantial justice was somehow done; the wisdom and the worth did get into parliament, and every interest did by right, or might, or sleight, get represented; — the same defence is set up for the existing institutions. They are not the best; they are not just; and in respect to you, personally, O brave young man! they cannot be justified. They have, it is most true, left you no acre for your own, and no law but our law, to the ordaining of which, you were no party. But they do answer the end, they are really friendly to the good; unfriendly to the bad; they second the industrious, and the kind; they foster genius. They really have so much flexibility as to afford your talent and character, on the whole, the same chance of demonstration and success which they might have, if there was no law and no property. It is trivial and merely superstitious to say that nothing is given you, no outfit, no exhibition; for in this institution of _credit_, which is as universal as honesty and promise in the human countenance, always some neighbor stands ready to be bread and land and tools and stock to the young adventurer. And if in any one respect they have come short, see what ample retribution of good they have made. They have lost no time and spared no expense to collect libraries, museums, galleries, colleges, palaces, hospitals, observatories, cities. The ages have not been idle, nor kings slack, nor the rich niggardly. Have we not atoned for this small offence (which we could not help) of leaving you no right in the soil, by this splendid indemnity of ancestral and national wealth? Would you have been born like a gipsy in a hedge, and preferred your freedom on a heath, and the range of a planet which had no shed or boscage to cover you from sun and wind, — to this towered and citied world? to this world of Rome, and Memphis, and Constantinople, and Vienna, and Paris, and London, and New York? For thee Naples, Florence, and Venice, for thee the fair Mediterranean, the sunny Adriatic; for thee both Indies smile; for thee the hospitable North opens its heated palaces under the polar circle; for thee roads have been cut in every direction across the land, and fleets of floating palaces with every security for strength, and provision for luxury, swim by sail and by steam through all the waters of this world. Every island for thee has a town; every town a hotel. Though thou wast born landless, yet to thy industry and thrift and small condescension to the established usage, — scores of servants are swarming in every strange place with cap and knee to thy command, scores, nay hundreds and thousands, for thy wardrobe, thy table, thy chamber, thy library, thy leisure; and every whim is anticipated and served by the best ability of the whole population of each country. The king on the throne governs for thee, and the judge judges; the barrister pleads, the farmer tills, the joiner hammers, the postman rides. Is it not exaggerating a trifle to insist on a formal acknowledgment of your claims, when these substantial advantages have been secured to you? Now can your children be educated, your labor turned to their advantage, and its fruits secured to them after your death. It is frivolous to say, you have no acre, because you have not a mathematically measured piece of land. Providence takes care that you shall have a place, that you are waited for, and come accredited; and, as soon as you put your gift to use, you shall have acre or acre's worth according to your exhibition of desert, — acre, if you need land; — acre's worth, if you prefer to draw, or carve, or make shoes, or wheels, to the tilling of the soil. Besides, it might temper your indignation at the supposed wrong which society has done you, to keep the question before you, how society got into this predicament? Who put things on this false basis? No single man, but all men. No man voluntarily and knowingly; but it is the result of that degree of culture there is in the planet. The order of things is as good as the character of the population permits. Consider it as the work of a great and beneficent and progressive necessity, which, from the first pulsation of the first animal life, up to the present high culture of the best nations, has advanced thus far. Thank the rude fostermother though she has taught you a better wisdom than her own, and has set hopes in your heart which shall be history in the next ages. You are yourself the result of this manner of living, this foul compromise, this vituperated Sodom. It nourished you with care and love on its breast, as it had nourished many a lover of the right, and many a poet, and prophet, and teacher of men. Is it so irremediably bad? Then again, if the mitigations are considered, do not all the mischiefs virtually vanish? The form is bad, but see you not how every personal character reacts on the form, and makes it new? A strong person makes the law and custom null before his own will. Then the principle of love and truth reappears in the strictest courts of fashion and property. Under the richest robes, in the darlings of the selectest circles of European or American aristocracy, the strong heart will beat with love of mankind, with impatience of accidental distinctions, with the desire to achieve its own fate, and make every ornament it wears authentic and real. Moreover, as we have already shown that there is no pure reformer, so it is to be considered that there is no pure conservative, no man who from the beginning to the end of his life maintains the defective institutions; but he who sets his face like a flint against every novelty, when approached in the confidence of conversation, in the presence of friendly and generous persons, has also his gracious and relenting motions, and espouses for the time the cause of man; and even if this be a shortlived emotion, yet the remembrance of it in private hours mitigates his selfishness and compliance with custom. The reformer concedes that these mitigations exist, and that, if he proposed comfort, he should take sides with the establishment. Your words are excellent, but they do not tell the whole. Conservatism is affluent and openhanded, but there is a cunning juggle in riches. I observe that they take somewhat for everything they give. I look bigger, but am less; I have more clothes, but am not so warm; more armor, but less courage; more books, but less wit. What you say of your planted, builded and decorated world, is true enough, and I gladly avail myself of its convenience; yet I have remarked that what holds in particular, holds in general, that the plant Man does not require for his most glorious flowering this pomp of preparation and convenience, but the thoughts of some beggarly Homer who strolled, God knows when, in the infancy and barbarism of the old world; the gravity and sense of some slave Moses who leads away his fellow slaves from their masters; the contemplation of some Scythian Anacharsis; the erect, formidable valor of some Dorian townsmen in the town of Sparta; the vigor of Clovis the Frank, and Alfred the Saxon, and Alaric the Goth, and Mahomet, Ali, and Omar the Arabians, Saladin the Curd, and Othman the Turk, sufficed to build what you call society, on the spot and in the instant when the sound mind in a sound body appeared. Rich and fine is your dress, O conservatism! your horses are of the best blood; your roads are well cut and well paved; your pantry is full of meats and your cellar of wines, and a very good state and condition are you for gentlemen and ladies to live under; but every one of these goods steals away a drop of my blood. I want the necessity of supplying my own wants. All this costly culture of yours is not necessary. Greatness does not need it. Yonder peasant, who sits neglected there in a corner, carries a whole revolution of man and nature in his head, which shall be a sacred history to some future ages. For man is the end of nature; nothing so easily organizes itself in every part of the universe as he; no moss, no lichen is so easily born; and he takes along with him and puts out from himself the whole apparatus of society and condition _extempore_, as an army encamps in a desert, and where all was just now blowing sand, creates a white city in an hour, a government, a market, a place for feasting, for conversation, and for love. These considerations, urged by those whose characters and whose fortunes are yet to be formed, must needs command the sympathy of all reasonable persons. But beside that charity which should make all adult persons interested for the youth, and engage them to see that he has a free field and fair play on his entrance into life, we are bound to see that the society, of which we compose a part, does not permit the formation or continuance of views and practices injurious to the honor and welfare of mankind. The objection to conservatism, when embodied in a party, is, that in its love of acts, it hates principles; it lives in the senses, not in truth; it sacrifices to despair; it goes for availableness in its candidate, not for worth; and for expediency in its measures, and not for the right. Under pretence of allowing for friction, it makes so many additions and supplements to the machine of society, that it will play smoothly and softly, but will no longer grind any grist. The conservative party in the universe concedes that the radical would talk sufficiently to the purpose, if we were still in the garden of Eden; he legislates for man as he ought to be; his theory is right, but he makes no allowance for friction; and this omission makes his whole doctrine false. The idealist retorts, that the conservative falls into a far more noxious error in the other extreme. The conservative assumes sickness as a necessity, and his social frame is a hospital, his total legislation is for the present distress, a universe in slippers and flannels, with bib and papspoon, swallowing pills and herb-tea. Sickness gets organized as well as health, the vice as well as the virtue. Now that a vicious system of trade has existed so long, it has stereotyped itself in the human generation, and misers are born. And now that sickness has got such a foot-hold, leprosy has grown cunning, has got into the ballot-box; the lepers outvote the clean; society has resolved itself into a Hospital Committee, and all its laws are quarantine. If any man resist, and set up a foolish hope he has entertained as good against the general despair, society frowns on him, shuts him out of her opportunities, her granaries, her refectories, her water and bread, and will serve him a sexton's turn. Conservatism takes as low a view of every part of human action and passion. Its religion is just as bad; a lozenge for the sick; a dolorous tune to beguile the distemper; mitigations of pain by pillows and anodynes; always mitigations, never remedies; pardons for sin, funeral honors, — never self-help, renovation, and virtue. Its social and political action has no better aim; to keep out wind and weather, to bring the day and year about, and make the world last our day; not to sit on the world and steer it; not to sink the memory of the past in the glory of a new and more excellent creation; a timid cobbler and patcher, it degrades whatever it touches. 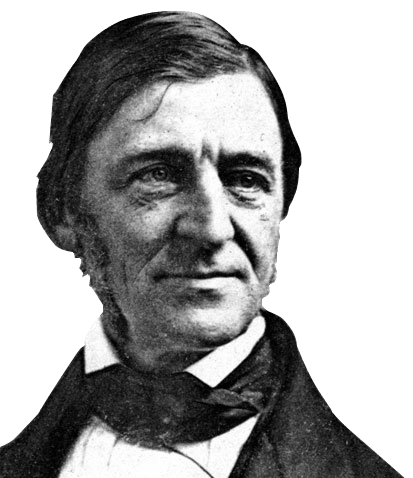 The cause of education is urged in this country with the utmost earnestness, — on what ground? why on this, that the people have the power, and if they are not instructed to sympathize with the intelligent, reading, trading, and governing class, inspired with a taste for the same competitions and prizes, they will upset the fair pageant of Judicature, and perhaps lay a hand on the sacred muniments of wealth itself, and new distribute the land. Religion is taught in the same spirit. The contractors who were building a road out of Baltimore, some years ago, found the Irish laborers quarrelsome and refractory, to a degree that embarrassed the agents, and seriously interrupted the progress of the work. The corporation were advised to call off the police, and build a Catholic chapel; which they did; the priest presently restored order, and the work went on prosperously. Such hints, be sure, are too valuable to be lost. If you do not value the Sabbath, or other religious institutions, give yourself no concern about maintaining them. They have already acquired a market value as conservators of property; and if priest and church-member should fail, the chambers of commerce and the presidents of the Banks, the very innholders and landlords of the county would muster with fury to their support. Of course, religion in such hands loses its essence. Instead of that reliance, which the soul suggests on the eternity of truth and duty, men are misled into a reliance on institutions, which, the moment they cease to be the instantaneous creations of the devout sentiment, are worthless. Religion among the low becomes low. As it loses its truth, it loses credit with the sagacious. They detect the falsehood of the preaching, but when they say so, all good citizens cry, Hush; do not weaken the state, do not take off the strait jacket from dangerous persons. Every honest fellow must keep up the hoax the best he can; must patronize providence and piety, and wherever he sees anything that will keep men amused, schools or churches or poetry, or picture-galleries or music, or what not, he must cry "Hist-a-boy," and urge the game on. What a compliment we pay to the good SPIRIT with our superserviceable zeal! But not to balance reasons for and against the establishment any longer, and if it still be asked in this necessity of partial organization, which party on the whole has the highest claims on our sympathy? I bring it home to the private heart, where all such questions must have their final arbitrement. How will every strong and generous mind choose its ground, — with the defenders of the old? or with the seekers of the new? Which is that state which promises to edify a great, brave, and beneficent man; to throw him on his resources, and tax the strength of his character? On which part will each of us find himself in the hour of health and of aspiration? I understand well the respect of mankind for war, because that breaks up the Chinese stagnation of society, and demonstrates the personal merits of all men. A state of war or anarchy, in which law has little force, is so far valuable, that it puts every man on trial. The man of principle is known as such, and even in the fury of faction is respected. In the civil wars of France, Montaigne alone, among all the French gentry, kept his castle gates unbarred, and made his personal integrity as good at least as a regiment. The man of courage and resources is shown, and the effeminate and base person. Those who rise above war, and those who fall below it, it easily discriminates, as well as those, who, accepting its rude conditions, keep their own head by their own sword. But in peace and a commercial state we depend, not as we ought, on our knowledge and all men's knowledge that we are honest men, but we cowardly lean on the virtue of others. For it is always at last the virtue of some men in the society, which keeps the law in any reverence and power. Is there not something shameful that I should owe my peaceful occupancy of my house and field, not to the knowledge of my countrymen that I am useful, but to their respect for sundry other reputable persons, I know not whom, whose joint virtues still keep the law in good odor? It will never make any difference to a hero what the laws are. His greatness will shine and accomplish itself unto the end, whether they second him or not. If he have earned his bread by drudgery, and in the narrow and crooked ways which were all an evil law had left him, he will make it at least honorable by his expenditure. Of the past he will take no heed; for its wrongs he will not hold himself responsible: he will say, all the meanness of my progenitors shall not bereave me of the power to make this hour and company fair and fortunate. Whatsoever streams of power and commodity flow to me, shall of me acquire healing virtue, and become fountains of safety. Cannot I too descend a Redeemer into nature? Whosoever hereafter shall name my name, shall not record a malefactor, but a benefactor in the earth. If there be power in good intention, in fidelity, and in toil, the north wind shall be purer, the stars in heaven shall glow with a kindlier beam, that I have lived. I am primarily engaged to myself to be a public servant of all the gods, to demonstrate to all men that there is intelligence and good will at the heart of things, and ever higher and yet higher leadings. These are my engagements; how can your law further or hinder me in what I shall do to men? On the other hand, these dispositions establish their relations to me. Wherever there is worth, I shall be greeted. Wherever there are men, are the objects of my study and love. Sooner or later all men will be my friends, and will testify in all methods the energy of their regard. I cannot thank your law for my protection. I protect it. It is not in its power to protect me. It is my business to make myself revered. I depend on my honor, my labor, and my dispositions, for my place in the affections of mankind, and not on any conventions or parchments of yours. But if I allow myself in derelictions, and become idle and dissolute, I quickly come to love the protection of a strong law, because I feel no title in myself to my advantages. To the intemperate and covetous person no love flows; to him mankind would pay no rent, no dividend, if force were once relaxed; nay, if they could give their verdict, they would say, that his self-indulgence and his oppression deserved punishment from society, and not that rich board and lodging he now enjoys. The law acts then as a screen of his unworthiness, and makes him worse the longer it protects him. In conclusion, to return from this alternation of partial views, to the high platform of universal and necessary history, it is a happiness for mankind that innovation has got on so far, and has so free a field before it. The boldness of the hope men entertain transcends all former experience. It calms and cheers them with the picture of a simple and equal life of truth and piety. And this hope flowered on what tree? It was not imported from the stock of some celestial plant, but grew here on the wild crab of conservatism. It is much that this old and vituperated system of things has borne so fair a child. It predicts that amidst a planet peopled with conservatives, one Reformer may yet be born.